Death Of An Airline (1998) (Series #1) (also available in Spanish) Video length - 36 minutes This video was the first of the series produced by System Safety Services. The video is based on an actual accident to a DC8 in Jeddah, Saudi Arabia. The "Dirty Dozen" are illustrated as the primary causes of the maintenance error in judgment that leads to the fatal accident. (See Case Study #1 below) The video is used in System Safety Services, Human Performance in Maintenance Part 2 workshop as well as in our Crew Decision Making Part 1 workshop. It is also useful for Management training as the root cause is in management and the company culture. Cost of this video or others in the series is $175.00 Canadian funds plus $25.00 Cdn. shipping and handling. 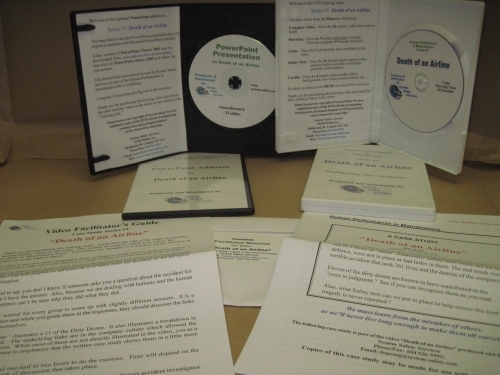 The complete series (6 training videos) may be obtained for $900.00 Canadian plus $25.00 Cdn. shipping and handling from System Safety Services. This is a savings of $275 over individual ordering and is only available through System Safety Services. 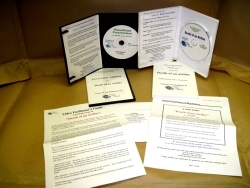 Funds from the videos are used to produce further training videos in the series.